Perimeter protection is an important asset for industrial, commercial, public or private residential sites. The security market offers today a complete range of reliable and intelligent perimeter protection systems, both for indoor and outdoor security needs, enhancing the best technologies in Microwave, Infrared and Doppler sensors in order to ensure total protection of sensible sites. Thanks to the sensibility levels these systems have achieved, along with newest intelligent warning signal analysis systems they work with, perimeter protection systems assure total security of buildings in all kind of sites, from high security areas like military and nuclear plants to industrial, commercial and residential needs. Whatever your needs are, find with CIAS the smartest, economical, easy installing and managing solution your security protection deserves. Entrances, fascias, windows, doorways and balconies can be protected with internal transceiver sensors for Indoor perimeter protection security, detecting perimeter intrusions using microwaves in small applications, as well as doppler technology sensors that creates curtain patterns focused on a restricted area. Ideal for Perimeter Protection of family houses, warehouses, storage facilities and others indoor sites. Outdoor Perimeter Protection systems can be installed on a pre-existing structure, such as on fences and perimeter walls, or as well outdoor security can be reached creating invisible open areas using microwave barriers that generate electromagnetic fields, or also with infrared beams that detect any kind of perturbing event, triggering alarms signals if crossed. CIAS has a complete range of solutions for perimeter protection, both indoor and outdoor. SIOUX 3.0, innovative fence protection system, made by kits of sensors with embedded MEMS technology and fuzzy logic analysis of the signal, it’s easy to install and giving 1mt accuracy pin point. IP native, suitable for fully IP integrated solutions. NEWTON and DARWIN are infrared barriers, respectively for Perimeter Protection and windows and doorways intrusion detection. NEWTON PLUS is an active infrared hybrid long range barrier, with cells that integrate dual Transmitter and Receiver function, quick and easy to install with self-alignment system. MURENA is a digital single head internal transceiver sensor that employs Doppler microwave detection ideal for dead zones in Perimeter Protection installations. CIAS Microwave barriers like ERMO 482, CORAL and MANTA work developing an electromagnetical beam using high frequency microwaves that creates an invisible but sensitive perimeter protection wall in outdoor open spaces. PYTHAGORAS 3 TECH is a Perimeter Protection system combining double or triple technology barriers: microwave, infrared and Doppler sensors, suitable for difficult installations such as long straight corridors or high risk sites such as prisons and nuclear facilities. CIAS products are enhanced with a unique and intelligent signal analysis system based on Fuzzy Logic, detecting real intrusions from environmental and climatic biases, lowering the number of false alarms. Special applications are also designed by CIAS answering answering challenging security needs in perimeter protection. 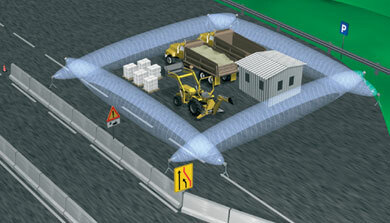 For your own perimeter protection, choose CIAS!